Anna Maria Rental Steps to Gulf Beach with Private Pool! 2000 square foot home on beautiful Anna Maria Island Florida, with all the upgrades and amenities. 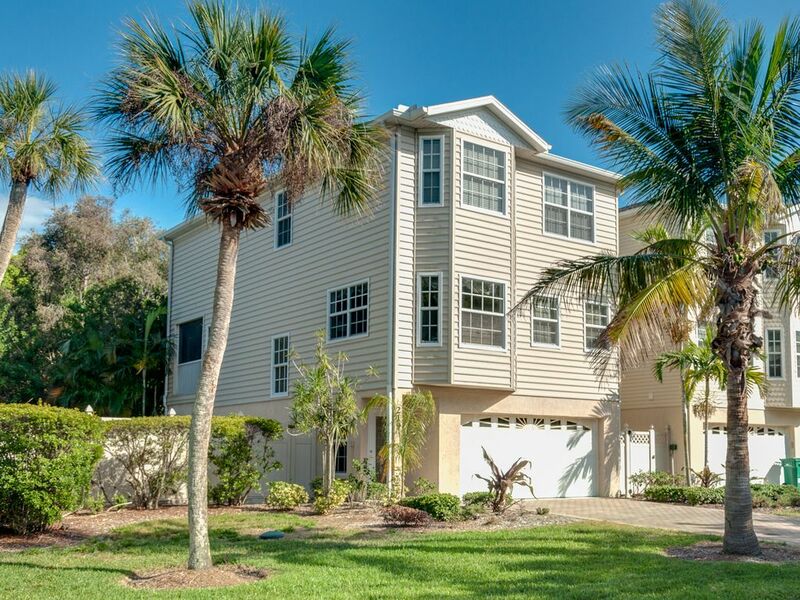 Short two block walk to the most beautiful white sand Gulf beach in the world and if you want to kick back at home at your private in-ground swimming pool. There is a spa with jets off the pool. NOTE: The spa is heated by a heat pump heater and is heated to 83 to 85 degrees. In the rare circumstance when the ambient air temperature is lower than the pool water the heater will not heat. Also please note it takes at least an hour to heat the spa to a temperature of 101 degrees so you need to plan ahead if you want to use the hot tub. Anna Maria Island is conveniently located near two major airports: Tampa International - 55 minutes drive or Sarasota Bradenton Airport, roughly 30 minutes drive. The island still maintains an old Florida feel, with uncrowded beaches and beautiful sunsets, while offering a diverse choice of restaurants and activities. World Class sunbathing, shelling, fishing, or just lounging are literally right outside your front door. With a private heated pool (winter only) and beach access, this house has everything you could ask for. The house is luxuriously furnished. Special designer touches include - crown moldings, upgraded countertops, Satellite Direct TV service with ability to connect to Netlix. DVD players, full wet bar, parking for two cars outside on driveway. The master suite has a king bed and a master bath fit for a king or queen with bathtub and separate shower. The second bedroom has a king-size bed and room for sitting and reading. The third bedroom has two twin beds. This is truly paradise within reach. You will come for two weeks and never want to leave. Our family is now on its 5th generation of family members calling Anna Maria our second home. This house is truly our extended family destination and we hope you enjoy the island and our home as much as we have over the years. Walk to the most perfect beach in the US, quiet tropical street, private pool, and close to major airports. We love having the pool in addition to the beach. Although nothing beats our great beach, its kind of nice to just hang with an adult beverage by the pool and have a BBQ with minimal hassle and convenience. But when it is beach time - 8 minutes walk and you are there, Best of both worlds. Plus we love the secluded, highly tropical feel of our street and heavy foliage. Private pool - The pool and spa are heated to 83-85 degrees. It is possible to heat the hot tub but because it is heated via a heat pump this can take up to an hour to increase the temp. Owner and property management are exceptional! We really enjoyed our stay. We had comfortable sleeping for all 8 of us. There was a thick memory foam cover provided that we used on the foldout coach. We found everything we needed, and felt well taken care of. The house is cute and roomy, and the walk to the beach is s breeze. So happy to hear that you guys had a great time!! Come back soon. John's house was large enough for all 8 of us and had everything we needed. We enjoyed our stay... plenty of room allowed everyone their own space... outdoor pool was a major plus for our three kids and because we rented a golf cart we were able to have quick access to anything we wanted to do in town...thanks! Great place and a great house! Thanks for the wonderful review! So glad you enjoyed our home, please come again. Well kept property and very convenient location. We loved it here. It had everything we needed and was just like the pictures indicated. Awesome!! Char, thanks so much for your great review and we are so glad you enjoyed our home! Please come again.